An army boot and a sandal discuss what to do with fallen former Pakistani Prime Minister Nawaz Sharif in a satirical social media video that highlights the way journalists shut out from the country’s mainstream media are turning to the Internet. The 70-second video, which has been seen more than 58,000 times, is the latest product of Matiullah Jan, a former television anchor at local Waqt TV, who says he was forced out of his job by Pakistan’s powerful military due to his criticism of the generals’ interference in politics shortly before the station closed last year. Jan, a gray-haired 50-year-old, is among around 3,000 journalists and media workers laid off in recent months amid a crackdown that started in the run-up to a July general election that brought Prime Minister Imran Khan to power. Like media organizations the world over, Pakistani newspapers and television stations are feeling the squeeze from social media companies such as Facebook that are eating into their advertising revenues. But some journalists also say Khan’s government and the military establishment that looms over Pakistani politics have deliberately sought to push out critical voices, forcing them to seek alternative outlets by squeezing media companies financially and through burdensome new regulations. “We don’t have to play with the words to say that the military establishment was pro-active in getting rid of pro-democracy journalists,” said Jan.
Pakistan’s military regularly denies undermining press freedom. Its media wing declined to comment in response to written questions submitted by Reuters. A government spokesman said job losses and declining business for some media was due to digital competition, not official pressure. If they are no longer seen on television, however, at least some of those laid off have been able to find alternative outlets, in Jan’s case a YouTube channel and a satirical social media video series called “Funny Gala” – a play on Bani Gala, the Islamabad suburb where Khan has a palatial hilltop home. In his video, “Boot Talk”, a play on a slang term used for the army, the sandal talks in the voice of the prime minister, meekly seeking orders from the military, who insist nonetheless that they are not interfering. “It might be your decision, we don’t mind,” says the boot, as the two discuss exiling Khan’s predecessor Nawaz Sharif, who fell out with the military and is currently serving a 10-year jail sentence for corruption. Behind the satire, is what many media workers say is an increasingly difficult environment for them in Pakistan. While journalists have rarely been jailed, writers and bloggers say several cases of reporters being abducted and beaten during the past year have created a climate in which they self-censor. The military and government have denied state agencies have been involved in any of those incidents. 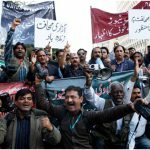 A report released by the U.S.-based Committee to Protect Journalists (CPJ) last year alleged that Pakistan’s military was using fear and intimidation to stifle the media and undermine press freedom. The military did not respond to requests for comment on the report at the time. “Press freedom is at stake – probably the worst it’s been in the history of Pakistan,” Rana Jawad, news director for Geo TV, a leading local station that has seen its advertising revenues halved by a government crackdown on media spending. The government has proposed a new draft law bringing regulation of all types of media under a single body, the Pakistan Media Regulatory Authority (PMRA). At the same time, the government has also introduced a new advertising policy for the media, which makes good part of its revenue from public sector advertising, raising rates for some and cutting for others. It has also refused to honor claims for past advertising spending, offering just 500 million rupees ($3.6 million) to settle claims media companies say amount to 8.5 billion rupees ($61 million). Chaudhry says the aim of the policy was to stop undue favors extended by previous administrations to select outlets, but media managers and opposition politicians accuse the government of using it to create a compliant media. “This government is confusing regulation with censorship, perhaps deliberately, in order to enforce a blanket one-party view on vital issues,” said opposition lawmaker Sherry Rehman. The media crisis has lately resulted in closures of news channels and newspapers, and leading organizations cutting their staff and salaries by up to 40 percent, correspondence between media groups and their staff seen by Reuters shows. Geo, which has not paid salaries for the last four months, has long been at odds with Khan and the military. In the run-up to last year’s election, cable companies stopped distributing Geo’s programming, effectively taking it off the air for most of the country. It was only restored after talks with the military on demands it make changes to its political coverage, according to officials at the channel’s media group. In such an environment, critical voices in the mainstream media have dwindled. “You are allowed to say things that the powerful wants you to say but you’re not allowed to say things that may be factual, that are a reality, but which do not sync with the narrative of the so-called state or the government,” Jawad said.